A wedding is a very special occasion in a girl’s life. A girl looks most beautiful on her wedding day. A look of a bride is incomplete without dazzling bridal accessory which complements the apparel of a bride. 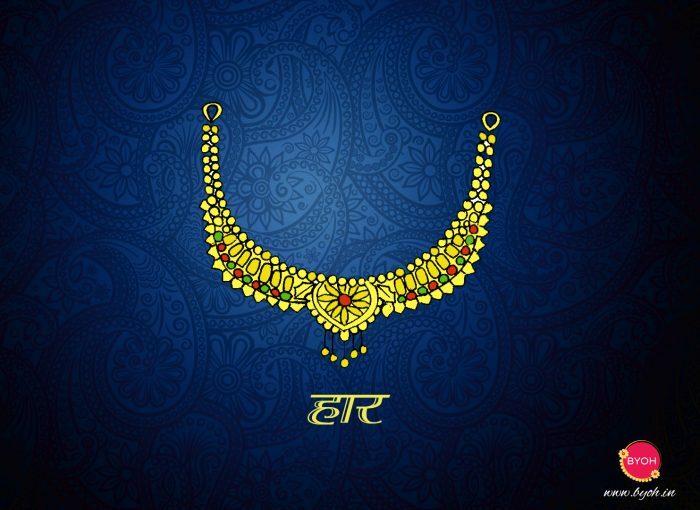 Jewellery of Uttarakhand reflects the rich authentic side of Uttarakhand culture and heritage. 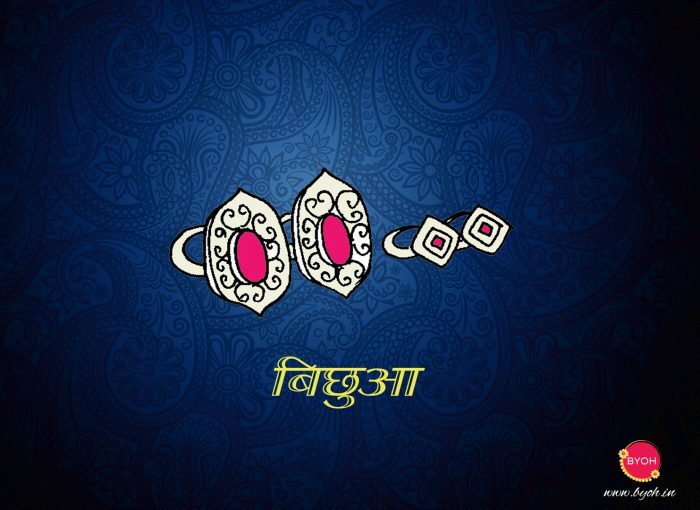 The simplicity of a Pahadi girl gets enhanced when she wears a traditional bridal accessory. Brides in Uttarakhand usually carry gold & silver crafted ornaments. In today’s era of modern designs, you can still find Pahadi & Kumayon brides adorning traditional jewellery pieces. 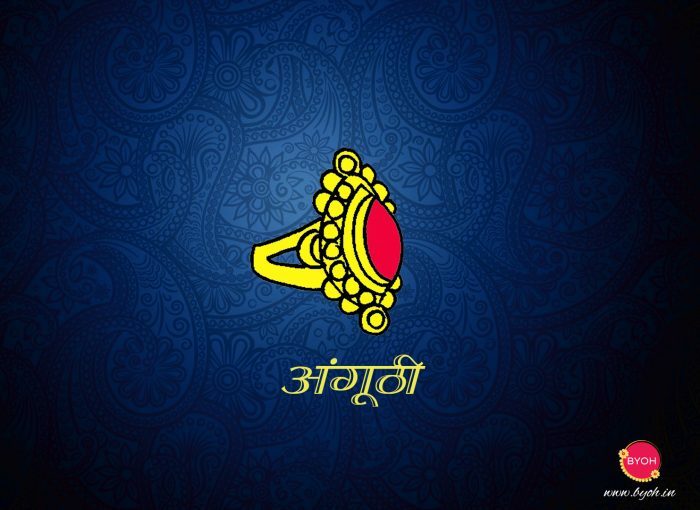 Every single bridal jewellery of Uttarakhand has its own importance and native design attached to it. The aura and influence of these pieces of jewellery are eternal. 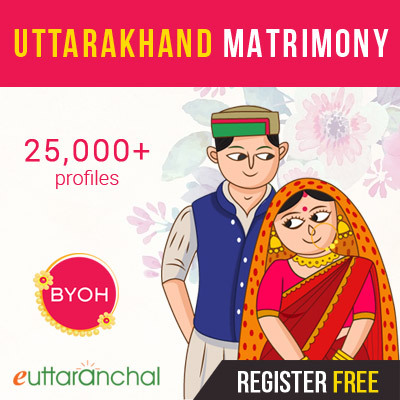 Let’s explore the rich traditional side of uphill areas and look at some of the vibrant jewellery of Uttarakhand that is worn by the bride on her special day. Anguthi: Anguthi is an ethnic accessory that has been worn since ages in India. The brides in Uttarakhand usually wear big gold rings that are studded with colorful gemstones. Bichhuwa: Bichhuwa is the toe rings that are worn on any of the toes by brides of Garhwali, Kumaoni and Jaunsari culture of Uttarakhand. These are mainly made of silver and carry beautiful intricate design. 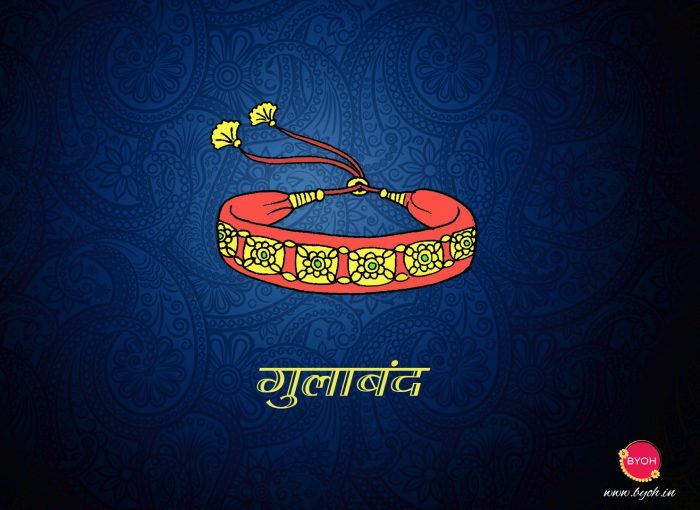 Galobandh: One of the important jewellery of Uttarakhand, Galobandh, also known as Galabandh is a fine neck piece that is donned by the brides of Kumaoni, Garhwali, and Jaunsari culture. It is a very antique ornament that consists of a red belt studded with gold work. Jhumkiya: Jhumkiya also popular as Jhumka are finely detailed gold earrings in the form of bell shape with a golden drop in the outer cupola. 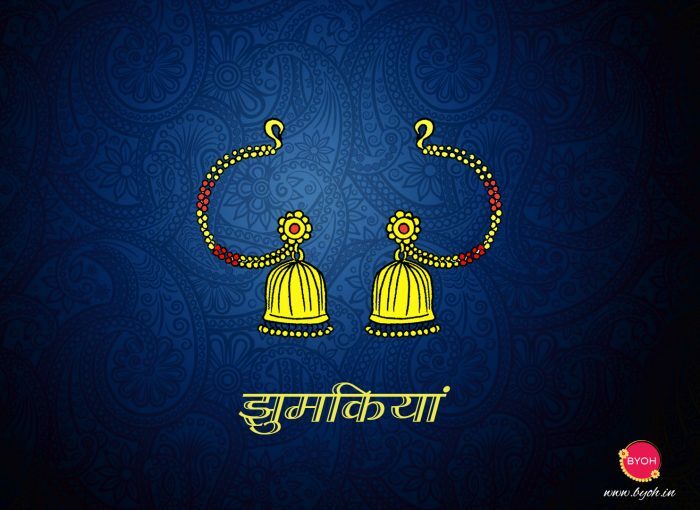 It is one of the most commonly adorned bridal ear accessory among Pahari women of Uttarakhand. 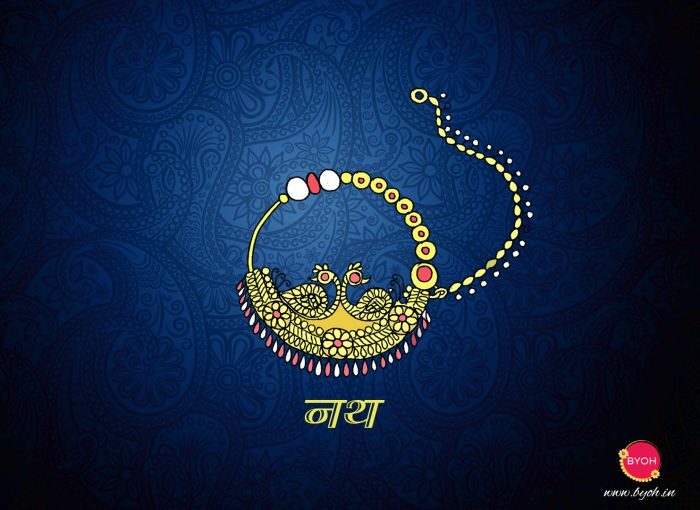 Haar: An elite neck piece, Har is one of the essential wedding jewelry of Uttarakhand brides which consists of intricate gold design. A simple Har elevates the whole get up of a bride and makes her look dazzling. Mangtika: A bride look is incomplete without a Mangtika in Kumaon and Garhwali culture. 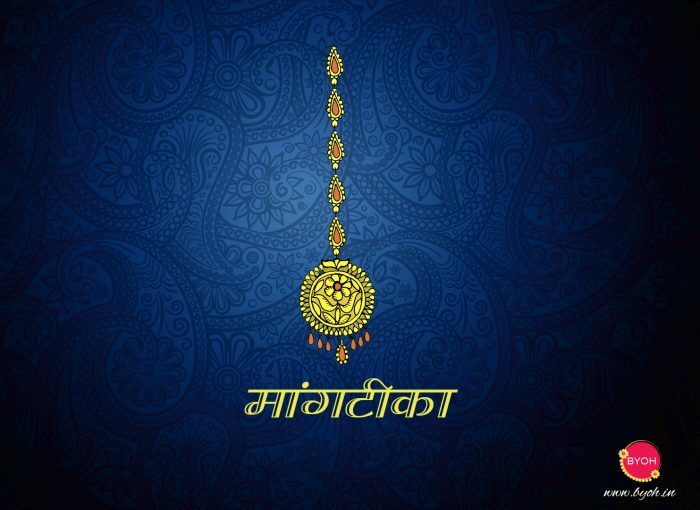 Mangtikka is a hair accessory which consists of a chain with a pendant that is hung in the front half of the forehead and compliments the overall look of a bride. 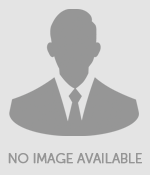 Mangalsutra: Mangalsutra is an important aspect of Indian weddings. 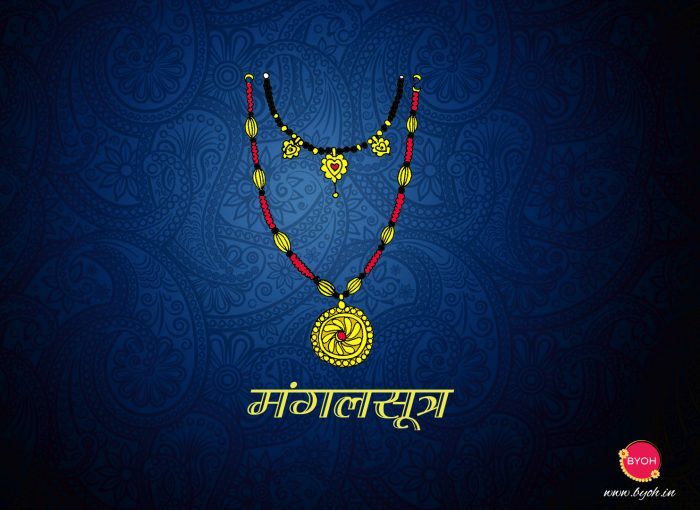 Mangalsutra is tied around the neck of the bride by the groom. The Mangalsutra worn by brides in Uttarakhand is slightly different in design as it is made of black or red beads chain and a gold pendant. 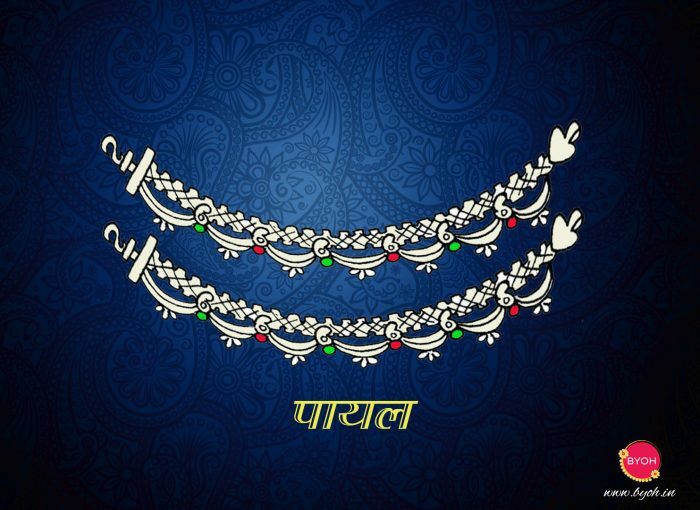 Payal: Payal is an anklet made out of silver & copper and is popular among Pahadi brides of Uttarakhand. The traditional design consists of an intricate pattern and is embedded with Ghunghroos or metallic balls. Nath: Nath or Nathuli is vital bridal jewelry that is worn by the brides of Uttarakhand in both Garhwal and Kumaon regions of Uttarakhand. The Nath or nose ring beautifies the attire of a bride on her wedding. Tehri Nath is very famous because of its stunning pattern and confined stonework. 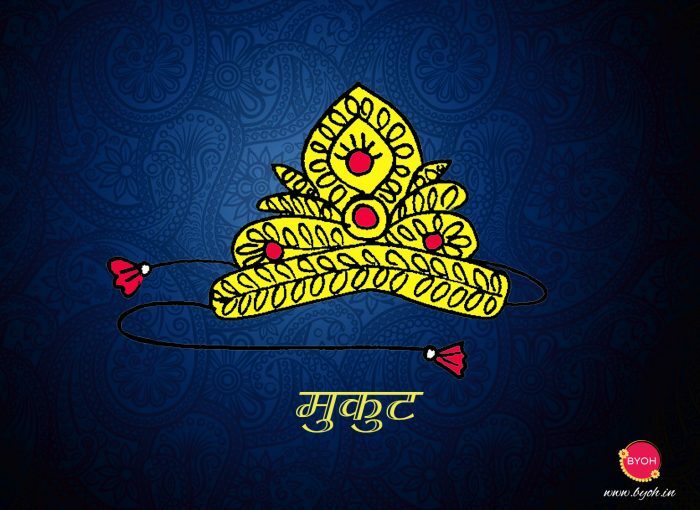 Mukut: Mukut is an essential part of bridal attire in Uttarakhand. Mukut is tied at the forehead and adds an ethnic touch of culture to the wedding look of brides. Ponchi: Ponchi is gold bangles that are worn by married women of Garhwal & Kumaon region on weddings and special occasions. To make these bangles, on red color cloth pure gold beads are studded and have a simple yet antique design. 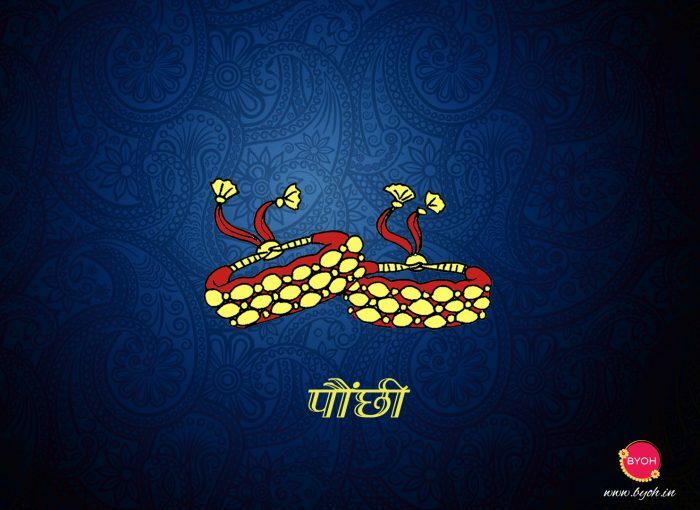 Last but not least, the list of the bridal accessory of Uttarakhand is incomplete without a Pichhoda. For Kumaoni bride, a Pichoda is a must. 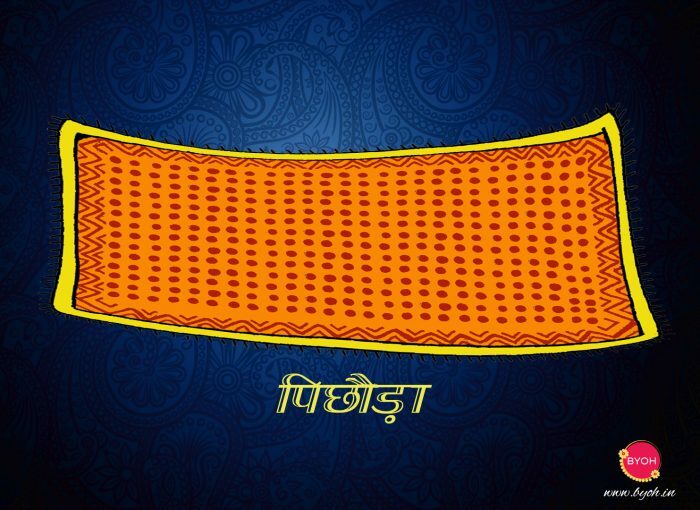 Pichoda is an integral accessory of Kumaon which is worn by the ladies on the wedding and religious functions. It is a yellow or saffron color wide cotton stole with bold imprints of brick-red polka dots and is worn over the sari. thanks for this details. Loved all the specialised designs. I found it is quite similar to bihar , up and jharkhand’s patterns.